This growing season has been marked by snakes in the garden, since the very first warm day with snakes above ground in March. Two humorous garter snake episodes followed with snakes in close quarters. The first was me shuffling my feet while trudging to the compost pile. My toe caught what I assumed was a stick and flipped it into the air. My brain said “how strange, that stick’s rubbery.” Then it landed and took off in a squiggle pattern for the woods. Oops! Both of these episodes had me laughing out loud and feeling a peculiar camaraderie with a reptile species that used to give me the willies. Finally, today, I nearly repositioned a potted perennial grass on top of something that looked strange at the last second. I thought it might be a piece of metal like a spring lying out in the garden which didn’t make sense. On closer inspection I discovered a young Eastern Milk Snake nestled under leaves. A small portion of his beautiful pattern was showing. I had never seen this type of snake and thought it might be a Michigan (Massasauga) Rattler. My husband was brave enough to gently pull away the leaves. 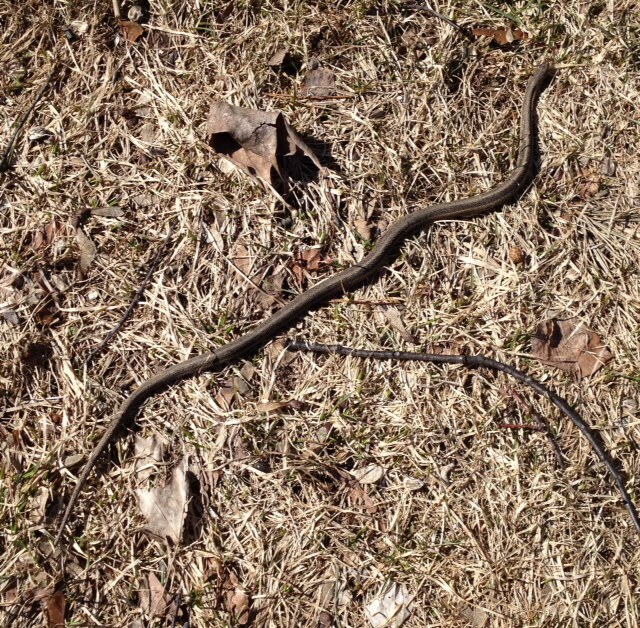 The snake was small but fierce and repeatedly lunged and bit at the leaves he moved and the twig he was using. It did not coil or rattle. Still, we tried not to touch it while we took some photos. 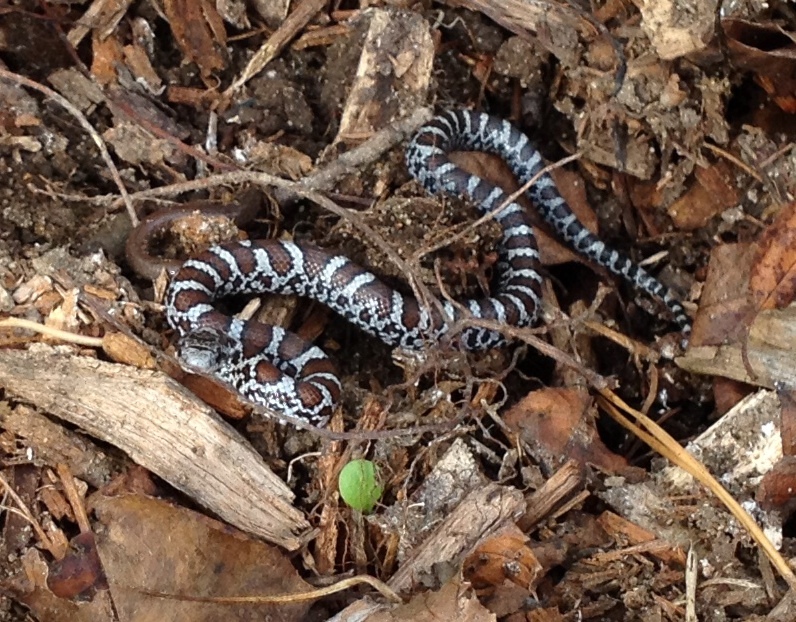 An online identification search convinced me that this snake is an Eastern Milk Snake. They eat insects and amphibians, but they love to eat rodents. 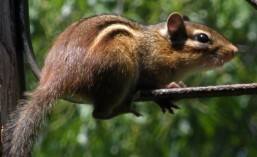 (We have plenty of mice, chipmunks and ground squirrels.) Eastern Milk Snakes are not venomous, which puts my mind at ease. My husband, Eric and his friends began brewing their own beer a little over a year ago. They’ve enjoyed success with a variety of recipes. 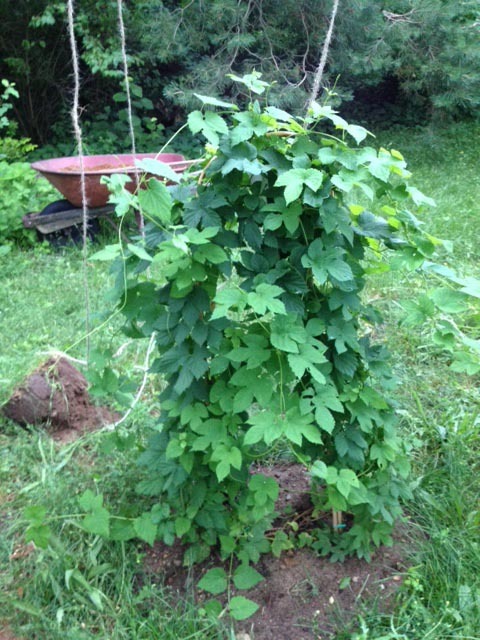 This year, I decided to give Eric hops plants to grow in the garden as a birthday gift. Hops vines grow quite tall and require trellising. 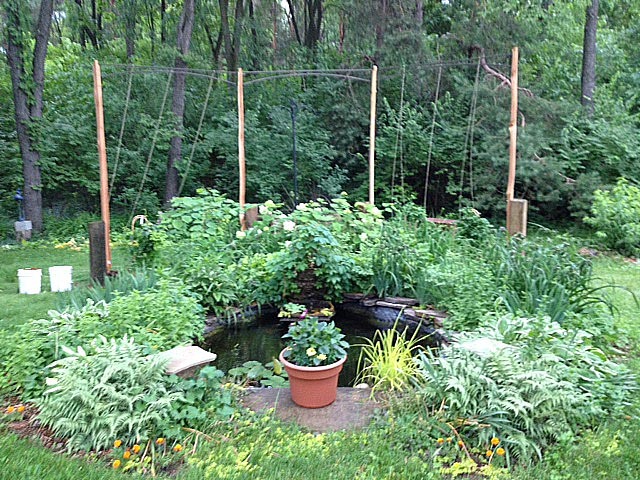 A tall trellis covered in leafy vines will provide a lush backdrop for our pond garden. The vines will grow up the right and left sides leaving the center opening as an arbor to walk through. We spent this afternoon outrunning a thunderstorm to install “Hops Henge” a trellis in our backyard consisting of 6″ x 8″ salvaged timbers donated by a generous neighbor and 10′ long split rails attached vertically with repurposed gazebo struts between them. The stormy weather hit just after we put the things up, so we have yet to train the vines up the strings. 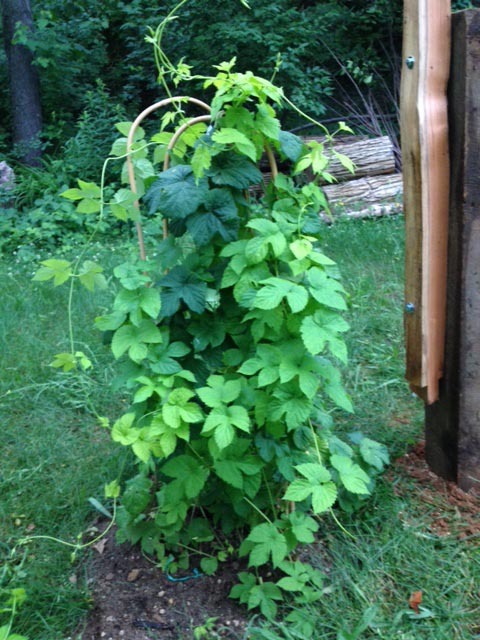 We have two varieties of hops as pictured below. I am sorry to report that many of our goldfish died this winter. The heavy snows, high winds and polar vortex combined have taken a significant toll on our aquatic life. The pond heater did it’s best to keep some water open under the canopy that shelters the unit from wind. Extremely cold temperatures created thick ice. Persistent high winds filled in the pond basin with deep snow restricting air flow. Most of our larger fish and one unfortunate frog have fed the crows. Some had been our friends for many seasons. We will miss them. At least one sizable fish is still alive. This gives me hope that others may also remain along with their smaller kindred. We will wait with hope until the weather warms enough to remove the heater and de-muck the basin. Eric and I have been experimenting with mead-making for about a year now. Our first two batches were encouraging, so we decided to use these grapes to make a “Pyment” or mead/wine hybrid. We meticulously separated the grape clusters and then squeezed over 3 quarts of juice out of the grapes. We added wildflower honey from a local apiary and some champagne yeast and hoped for the best. Our primary fermentation went well as did the second phase. We recently bottled the pyment, and I added the labels just a couple of days ago. 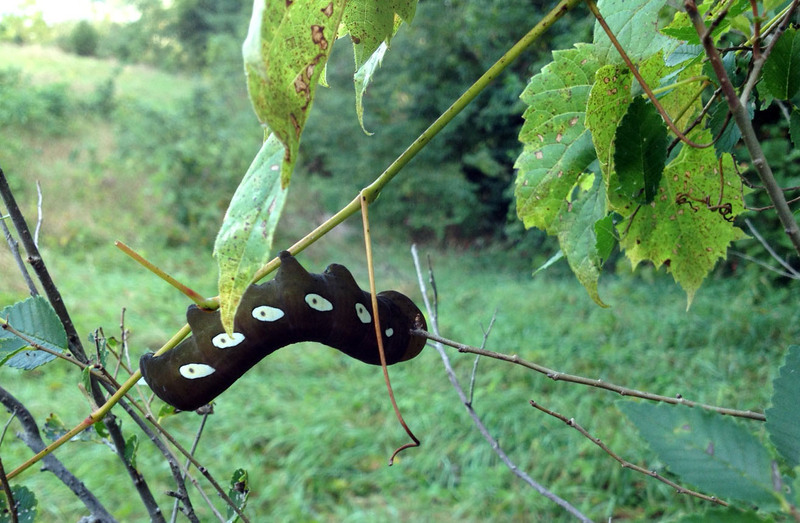 The moth depicted on the label is the adult stage of the species of caterpillar pictured below. We named our drink “Pandora Pyment” in honor of the spectacular bug that we found on the grape vines. Now we just have to wait 4-6 more months before the pyment is finished and ready to taste! 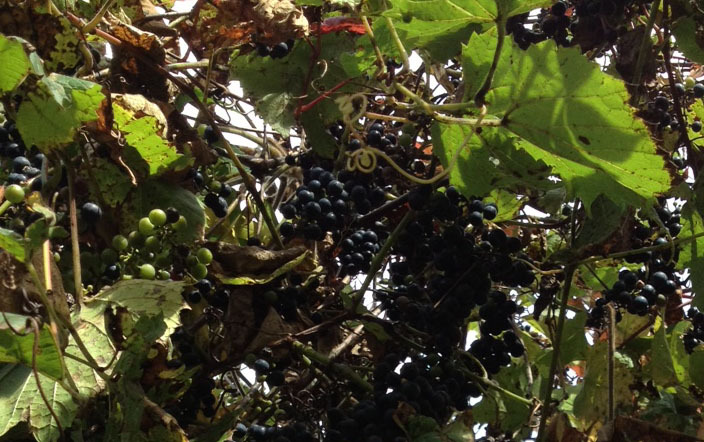 Mid September is a perfect time to find wild grapes ripening on the vines. As Aesop’s fables indicate, the best ones are just out of reach! After breakfast, Eric and I took a stroll down a neighboring hillside where wild grapes grow at the edge of the woods. Eric chuckled at me as I optimistically took along a three gallon bucket. The grape vines at the top of the hill had no fruit so we continued on down the slope which ends with a lake at the bottom. Soon we started to find bunches of grapes on the vines and look what else we found! This amazing bug will transform into a beautiful green and brown pandora sphinx moth. This enormous brown caterpillar with white spots is the larvae of Eumorpha pandorus, the pandora sphinx moth. Grape vines are the favorite food of this creature. We marveled and took photos. Our morning walk rewarded us with more than exercise! to savor in early Fall. As we continued on our foraging we found more and choicer grape clusters the further downhill we went. By the time we got to the water’s edge we had a nearly full bucket. It pays to be optimistic! 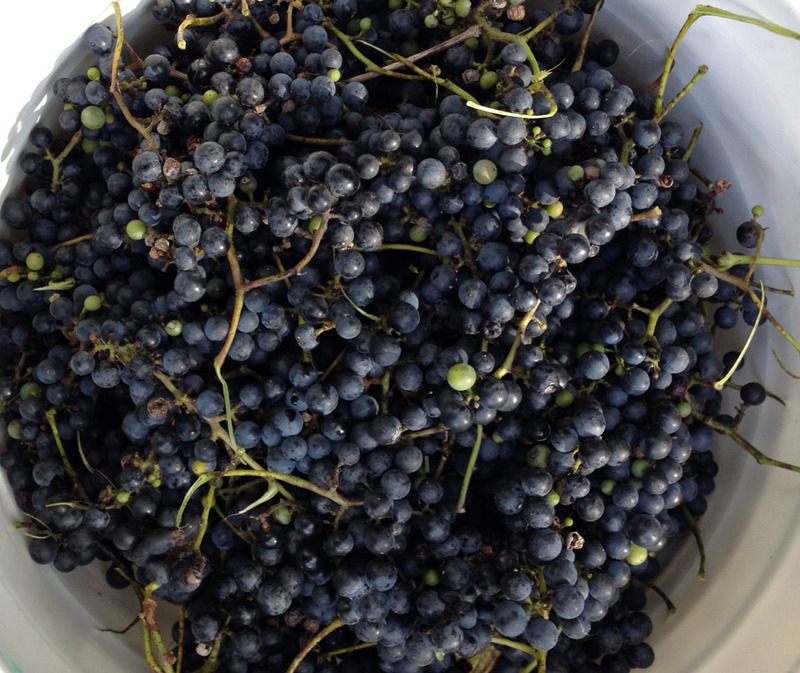 We will process the fruit into something delicious and revel in the rich autumn flavor of wild grapes. The sunflowers are blooming at the back of the veggie patch. 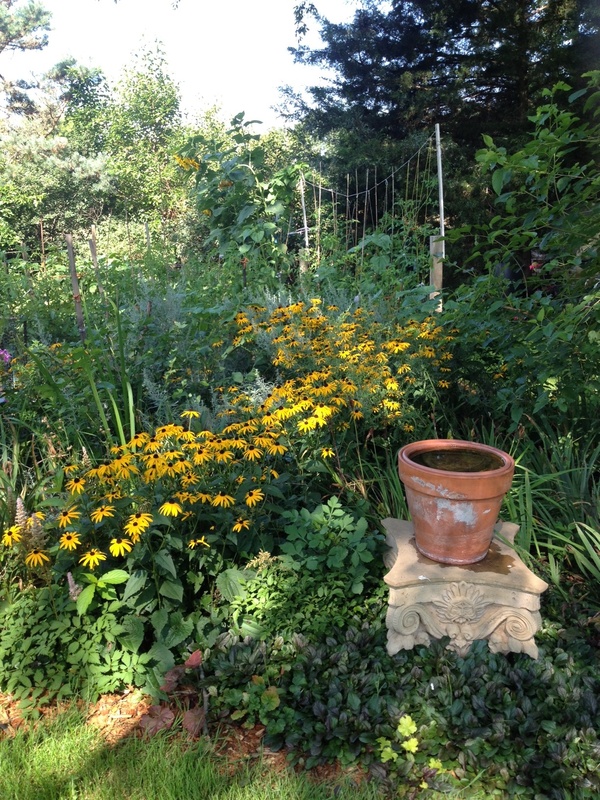 This one is a Mammoth Russian Sunflower grown from seed and now 10 feet tall! You’d never expect it to blend into the background. The veggie patch often overflows its boundaries into the adjacent flower bed. 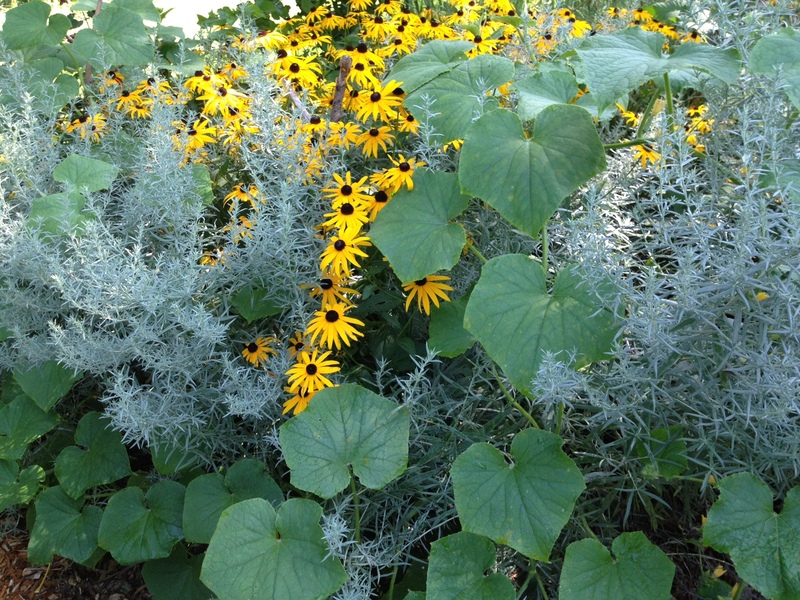 The photo here shows cucumber vines rambling over artemisia and rudbeckia plants. The interplay of textures and colors is visually appealing, and the chicken wire support trellis is completely hidden in the foliage! Can you find the sunflower pictured in the first photo? Do you know where the cucumbers are hidden? Integrating vegetable plants with ornamentals creates a soft transition between the veggie patch and the surrounding landscape. ‘Tis the season for Peaches! This is the very first year I have harvested peaches from trees in my yard that sprouted from pits! It’s taken 6 or more years for them to grow big enough to bear fruit. The pie pictured was made from several of the peaches off of those trees plus a few purchased to round out the recipe. Delicious! Peach trees bloom a beautiful bubblegum pink. This year we had a mild spring with no late freezes, so the buds survived. Also, rainfall this summer has been fairly regular. The trees did not suffer from drought, so the fruit was able to mature normally. I hope to bake more home grown peach pies in the years to come. Peaches and Cream Pie involves a whipping cream sauce that is poured over the peach slices before baking. The sauce fills in all the spaces between the peaches and makes for a very satisfying pie. Peaches and Cream Pie will not “set up” until it is chilled overnight. Impatient bakers may decide to serve the pie over ice cream as it can be quite runny when hot out of the oven. Refrigeration is important for this pie! Place the pie or whatever remains of it in the refrigerator as soon as it cools. It is delicious served hot or cold. This pie is not particularly sweet if made with fresh peaches – it only contains 1/3 cup sugar. It is much sweeter if made with thawed home-frozen peaches that contain their own syrup. I usually drain off the syrup from the frozen peaches and set it aside for use as an ingredient in fruit smoothies or as a topping for French toast. This pie can also be made with a few blueberries tossed on to add color and additional flavor. 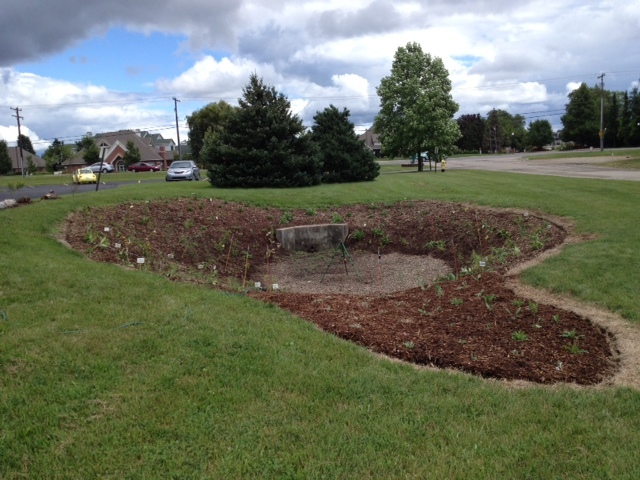 This season’s gardening effort has featured the Skyridge Wildlife Garden Project. I have been part of the project from helping to write a grant proposal last summer to a whirlwind of planting activity through the months of June and July! 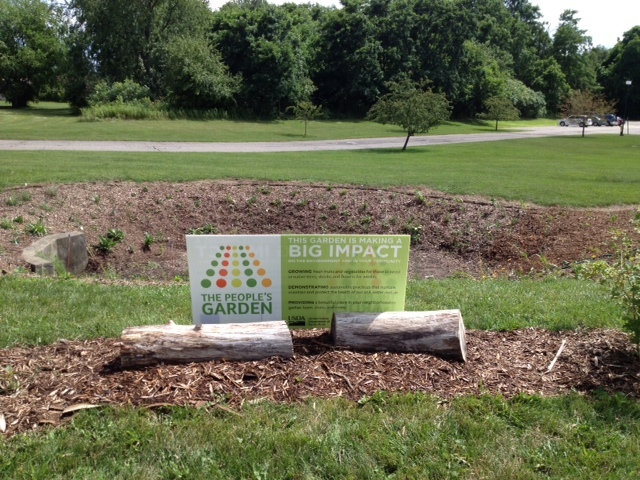 Skyridge Wildlife Garden is a native plant garden located at Skyridge Church of the Brethren in Kalamazoo, Michigan. The garden area is the basin of a storm water detention area and the surrounding slopes. My fellow volunteers and I have installed over 40 varieties of native plants to help support native pollinators and other area wildlife! Click on the link in yellow text above to view the Skyridge Wildlife Garden website.